Sometimes, I just want a burger and fries, but I really don’t like deep frying. Buying burgers and fries for our family costs a minimum of $25 dollars, and sometimes, it costs more. Since I am always trying to save money and provide my family with relatively healthy meals, I needed to find a better way to make burgers and fries at home without a deep fryer. That was when my friend, Amber, came to my rescue. She told me about oven fries. I was surprised at how easy the instructions were, and I couldn’t wait to try her recipe. The most time consuming part was washing and cutting the potatoes. They are tossed with one to two tablespoons of olive oil and sprinkled with your favorite spice blend. I frequently use seasoned salt. The potatoes are then placed in a 400 degree oven for 15 – 20 minutes until the potatoes are cooked through and slightly browned. That’s really all it takes to make delicious fries that contain less fat without sacrificing flavor. A delicious and easy side dish. Wedges of potatoes are tossed with olive oil and seasoning. 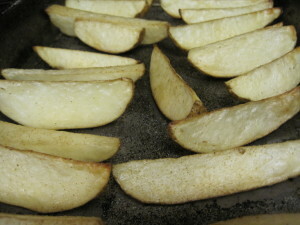 Wash potatoes and cut into 8 to 12 wedges. Place potato wedges in to a bowl. Toss together until all potatoes are coated with the oil and salt. They should not be overly greasy. 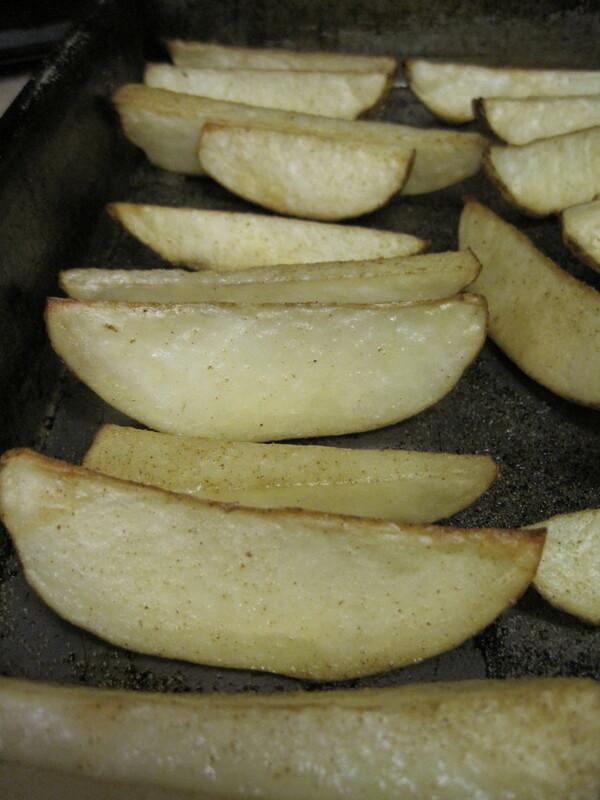 Arrange potato wedges in a single layer on a baking sheet or pan. Place in preheated oven for 15 - 20 minutes or until light golden brown. Okay, now you’ve got me craving fries – and a burger because when I eat fries, I like to eat them with a burger. Homemade burger and homemade baked fries would definitely be the healthiest to eat. But since neither are on my menu today, I will be anxiously waiting until I can satisfy the craving. You should whip up a batch of these oven fries to try. Lower calorie than the deep fried version and still very tasty.